Friday seemed to come around very quickly this week, and because we're here again I wanted to share Biscuit's Friday Treat with you all again. Now I did mention last week that I try and get a variety of things, so this week I went for something she wouldn't be expecting! 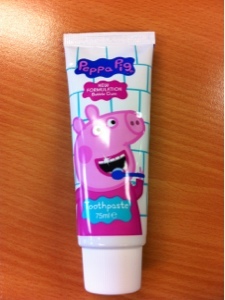 Friday Treat: Peppa Pig Bubblegum Flavour Toothpaste. I've only ever had minty toothpaste, has anyone tried out different flavours before? This weeks curry was Lamb Madras with mixed lentil daal. It was very nice, peppery rather than hot. I'd say a good 7/10. I tried some of my son's strawberry toothpaste the other day! There's no wonder he suddenly started asking to brush his teeth all the time. it's so sweet! It really messed with my head, 'it's sweet but I'm cleaning my teeth with it'!!! I know just what you mean! Toothpaste SHOULD be minty! Anything else is pretty much madness! I know?! Who'd want to put pig juice in their mouth? Though I'm not quite clear on what pig juice actually is....I love the fact you've used it a few times! Ha! Kale would literally die if he had this toothpaste. He LOVES peppa pig and I've never seen anything peppe pig around here. Lol bless her, pig juice!